太陽熱、ありがとう。 Thanks for the solar heat. We can’t use the (heat pump) water heater because of the water failure for about 10 days until next Monday. Then I have made a simple solar water heater as an urgent countermeasure using only what we have now on hand. 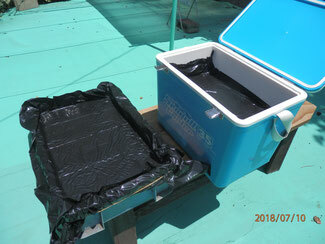 The materials are a 30 – 40 liter plastic box and a cooler and a thin black plastic sheet to cover the water surface in the boxes. At this time after the rainy season, the solar heat can produce warm water suitable for bathing in about 5 hours. The water volume is enough for showering.